Patrick Carpet Cleaning - Gosport, Fareham, Lee on the Solent, Stubbington, Hill Head. We provide a complete professional carpet and upholstery cleaning service for all your requirements. 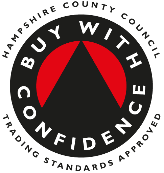 Based in Gosport, we are a family run business which allows us to give you the best competitive prices whilst still maintaining our high quality standards. Our hot water extraction process is the one most carpet manufacturers recommend. Using the latest cleaning methods and machines we are able to cover every type of cleaning job and always make sure that we use the right system. We strive to make things hassle-free by arranging convenient, on-time appointments and we guard against surprises by providing a free written quotation prior to any service. Areas we cover: Fareham, Gosport, Hill Head, Lee-on-the-Solent, Locks Heath, Portchester, Stubbington, Titchfield, Warsash and other surrounding towns and villages. You can check us out on Checkatrade, just click the logo.